THE COMING OF THE ROBOTS: WHAT IMPLICATIONS FOR JOB QUALITY? With the advancement of artificial intelligence, cloud learning and robot engineering there is a growing public concern, shared by social scientist and policy makers alike, about the employment implications of the new developments in computerization and robotization of activities so far performed by workers. In 2013, Carl B. Frey and Michael A. Osborne, of Oxford University, published a paper aiming at estimating how susceptible different jobs may be to computerization. According to their estimates around 47% of total US employment was at risk. The question we would like to rise in this blog is what kind of jobs, in terms of job quality, are more susceptible of automatization. In order to do so, we have related the probability of computerization as estimated by Frey and Osborne with the Job Quality Index of such occupations as measured by Muñoz de Bustillo et al. (2011) at the European level. Due to the different occupation classification used in the US and EU, our analysis has been limited to 39 occupations. 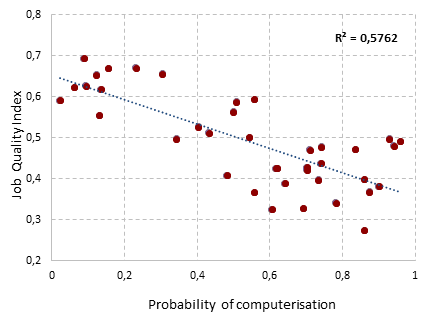 Figure 1 reproduces the relation between the risk of computerization (or risk of automation) and the JQI of the occupation in 2010. The figure speaks for itself. There is a clear inverse association between the probability of computerization and job quality, i.e. those jobs with higher risk of being in the future performed by machines are characterized by lower levels of job quality. To give a flavor of the results, the occupation with lowest probability of computerization, health professionals (0.022) has a relatively high JQI (0.59); the same can be said of chief executives, senior officials and legislators, with a JQI of 0.69 and a relatively low risk of computerization of 0.087. On the other end we find occupations such as Food preparation assistants (high risk: 0.860, low job quality: 0.27) or cleaners and helpers (high risk: 0.605, low job quality: 0.325). Therefore, this quick inspection suggests that statistically speaking, robotization will have more impact in low quality jobs. Thus, it can be argued that it will contribute to the process of freeing human beings from the drudgery of hard and unpleasant work (as it has done in the past, i.e. of the legions of workers that cleaned the streets of horse manure before the arrival of cars). The figure also shows, however, that mid and high quality jobs can also be affected, albeit to a much lower extent. Figure 1. Probability of computerization and IJQ in 39 occupations. Source: Author´s analysis from Frey and Osborne (2013) and EWCS microdata. A final caveat: the results presented above refer only to the types of job potentially destroyed by computerization, without taking into consideration the jobs that will most likely be created in the process of building the machines that will substitute worker (generally high quality jobs) or other jobs created indirectly by the expanding consumption capacity of society. That’s a complex issue that we leave for another blog piece. See, for example, Jeremy Rifkin´s the End of Work, Andrew McAfee and Erik Brynjolfsson, The Second Machine Age, or the Rise of the Robots by Martin Ford. Carl B. Frey and Michael A. Osborne (2013): The Future of Employment: How susceptible are jobs to computerization? Oxford University. Muñoz de Bustillo, R., Fernández-Macías, E., Antón, J. I., and Esteve, F. (2011): Measuring more than money. The social economics of job quality, Chelthenham: Edward Elgar. The authors want to thank Martina Bisello and Enrique Fernández-Macías (of Eurofound) for her assistance in the conversion of the US Standard Occupational Classiﬁcation (SOC) into the European ISCO system, as well as in the processing of Frey and Osborne (2014) probabilities of computerization estimates. On this issue see Joel Tarr and Clay McShane (1997): “The Centrality of the Horse to the Nineteenth-Century American City” in Raymond Mohl (ed. ): The Making of Urban America, NY: SR Publishers, pp. 105-130. Read more about THE COMING OF THE ROBOTS: WHAT IMPLICATIONS FOR JOB QUALITY?